A study by environmental health scientists at Columbia University examined the release of vapors from gas station vent pipes and found that emissions were 10 times higher than the estimates used to establish setback regulations that determine how close schools, playgrounds, and parks can be to the facilities. Gasoline vapors, which are invisible but have a distinctive odor, contain a number of toxic chemicals, notably benzene, which is carcinogenic. The researchers installed gas flow meters to venting pipes at large gas stations in the Midwest and Northwest and took measurements over a three-week period. They reported daily evaporative losses between 1.4 pounds and 1.7 pounds of gasoline per 1,000 gallons dispensed at the pump. By comparison, the California Air Resources Board determined their setback regulation for location near gas stations using an estimate of 0.11 pounds per 1,000 gallons. The study also simulated how the fuel vapor was carried in the air to assess the potential for short- and medium-term benzene exposure and found that the reference exposure level was exceeded at distances greater than 50 meters and sometimes as high as 160 meters. 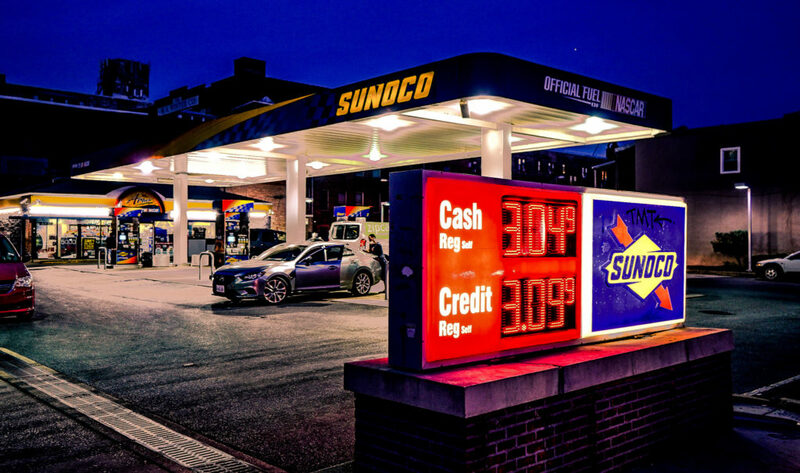 In urban areas like New York City, some gas stations are located directly adjacent to apartment buildings. Modern gas pumps and automobile fill spouts have been designed to minimize the amount of gasoline vapor that gets into the air. There are efforts to minimize the release of gasoline as fuel is stored and transferred between tank trucks and storage tanks. But it now appears that more needs to be done to prevent gasoline from getting into the environment. As long as we continue to use gasoline to power our vehicles, we need to do everything we can to keep away from the stuff. Photo, posted July 19, 2018, courtesy of Ted Eytan via Flickr. ‘Fumes from Gas Stations’ from Earth Wise is a production of WAMC Northeast Public Radio.